How do you compete when you’re offering the same product at the same price point? You amplify the business value by making it easy to connect your product to your customers’ business objectives. Leveraging real-time usage data, carriers are using this approach to reinvent a 50+ year old commodity into a goldmine for their business customers. It may seem hard to believe but toll-free numbers have been around since the 1960s. The concept is simple – a cost-free way for consumers to connect with businesses. This age-old product has held its own despite changing markets and advancements in technology. In fact, 99% of big business use them today. So if toll-free numbers are so widely used, what’s the challenge? Every toll-free provider (and there are a lot of them) has the exact same value proposition – a cost-free way for consumers to connect with businesses. This standardization, and very tactical approach, makes it hard to compete on anything besides price. But according to Globys research, some carriers have discovered that it’s not necessarily the product or price that attracts or keeps the customer – but the usage data tied to the product. The key is understanding why customers are using the product and then making it as easy as possible for them to track the usage in a purposeful way. For toll-free, customers want more than just looking at call volumes to know if the product is being used. 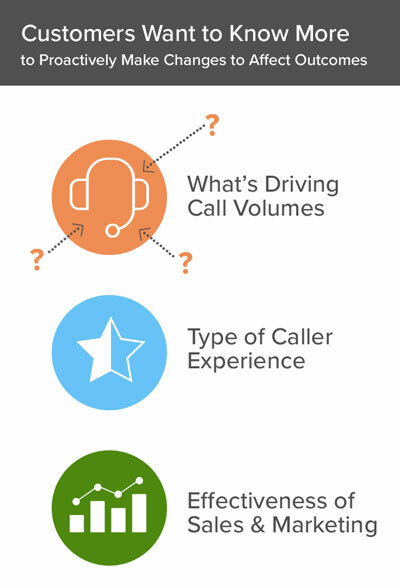 They want to understand what’s driving (or not driving) inbound call volumes, the type of caller experience they’re providing, the effectiveness of their sales and marketing efforts, etc. – and they want to proactively make changes in order to alter the resulting outcomes. Businesses use inbound call stats to determine if volumes and resulting actions are in line with what’s expected. With real-time visibility and notifications, users can quickly identify if answer rates are below average, indicating a resource constraint or training need. Detailed data, such as call origin, destination, duration, hour of day, etc. allows users to easily identify trends and compare performance against a wide array of data points. Similar to the above, users leverage real-time usage data to identify the need for resource reassignments. As opposed to waiting until month’s end to review the post-dated usage activity on the invoice, users are alerted of spikes in call volumes, unanswered calls, routing due to high wait times, or activity during specified time periods. This allows the business to dynamically staff according to activity. Although toll-free numbers are often associated with customer support, they are also heavily used on the sales front. Real-time visibility allows users to view which numbers, specific locations, regions, etc. are driving the most inbound call volumes to easily determine the correlation between sales presence and call volumes. With direct access to real-time usage data, marketing users can identify which channels are driving (or not driving) inquiries, helping to determine if changes in placement or spend is required. This use case has become even more relevant as the placement of toll-free numbers has become much more agile with the introduction of digital channels. Instead of hard-printed phone books and brochures, these numbers are now integrated into dynamic content, such as targeted emails and .com sites, which can be easily adapted based on resulting activity. STAY TUNED for another post on ‘Real-time usage: What’s Important to Your Business Customers’, where we’ll continue to highlight the business drivers that are contributing to the successful adoption (and revenues) of the real-time usage component. You can also attend the “Unlocking the Power of Usage Data” webinar on June 28 for a deeper dive on this series. This webinar will outline the solution to provide your customers with a near real-time view and 24×7 monitoring of their company’s utilization of your usage-based services, along with best practices and real world scenarios.